The tasty little devil in all it’s disc-shaped glory. Another automatic buy for me, this ludicrously long-named treat is – brace yourselves – the best bit of chocolate I’ve ever eaten at Trader Joe’s. I’ll get into the details a little bit later, but suffice to say this quirky round of chocolate is akin to the sweet, strange girl you had a crush on in high school – the one who wore high yellow stockings and the choker and the long tresses of coppery-red hair. I can only hope you are so lucky to have a local Trader Joe’s that stocks this fine treat. That said, if you do, and if you take my recommendation and try some yourself, you’ll be putting your poor little heart out on the line – much the way you did when you finally worked up the courage to ask that cute, quirky girl out on a date. 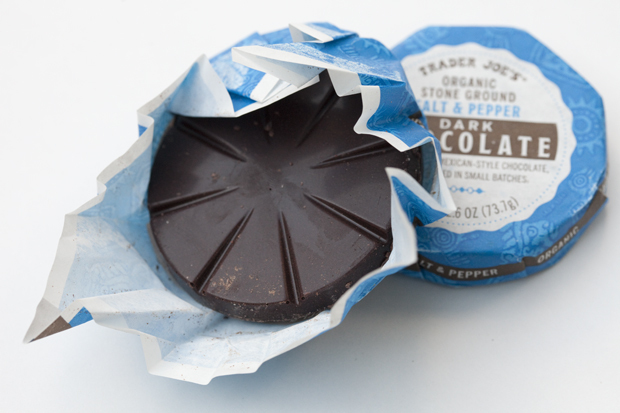 The cold hard fact of the matter is that Trader Joe’s has already decided to discontinue this delicious chocolate. Damn. Isn’t that always the way? Just the same as when she shook those red tresses and told you her family was moving out of town tomorrow. But that’s another story. Before I get too mired in regret here, let’s explore the unique delights of this organic, stone-ground salt and pepper dark chocolate. 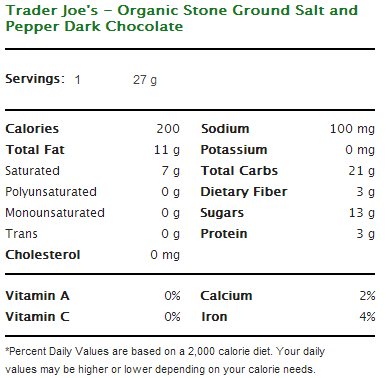 Now, my reservations about dark chocolate are well documented, and never in my life have I heard of such a combination with two common table seasonings, but if Trader Joe’s can keep dishing it out, I can keep taking it. This is one of those miraculous cases where utterly incompatible sounding ingredients couldn’t compliment each other better. Let’s start with the chocolate itself. First off, this is the first instance of Mexican dark chocolate I’ve ever encountered – and I have to say I liked it. It has the graininess you associate with Mexican chocolate (thanks to the stone-grinding process which minimally refines the cacao beans), and the heavy, complex notes of casual bitterness and subtle fruitiness you associate with dark chocolate. A good start – and intriguingly packaged in flat rounds wrapped simply in paper. The addition to salt to dark chocolate is far from a new innovation, but adding black pepper to the mix is a bit of a revelation. The combo is so obvious it’s shocking I’ve never seen it before – given the craze for mixing everything and anything with chocolate nowadays. The mixture is far too delicious – a host of different tastes, bitter, sweet, salty and peppery, working in conjunction to drive you to taste a little more. I buy dark chocolate bars primarily for one reason: I tend to gobble down chocolate and it’s almost impossible to gobble down something as bitter and textured as dark chocolate. TJ’s has created one overpowering exception to that rule with this concoction – as soon as I snap into a pleasantly gritty round of this stuff, I know I’ll be finishing it in one sitting. Did I mention it’s all organic to boot? Well-played TJ’s, well-played. Would I recommend it: Yes, but get it fast! Final Synopsis: For the dark chocolate aficionado, this bar’s a must try. I love this kind of chocolate. I kept thinking about it and wanting more. I went back and they tell me Trader Joe’s is no longer selling this great treat. I can’t imagine why, and I am very disappointed to say the least. Had it for the first time today and found out the are getting rid of it now….go figure!! It happens to be my favorite chocolate ever….NOW WHAT?? I went to three TJ’s locations here in the Bay Area and none of them carried these anymore. It seems like people love this product. How come they decided to discontinue?